We didn't have store bought jump ropes when I was growing up. We just made them out of rubber bands. These were simply doubled up and linked making a long chain. The rubber bands came in all sorts of colors and were very inexpensive. Fast forward a lot of time and we have the a new use of these rubber bands. Thanks to Madeleine of Rags to Couture for the inspiration. 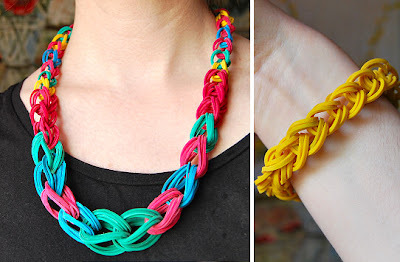 I really like how she used a group of rubber bands to make a more substantial chain. This is the sort of project that youngsters will love to. So if you are buying rubber bands in bulk, may be you could make a one for yourself. Rubber might seem like an unlikely material but it is used in jewelry. Chain mailers use rubber rings to add color and stretch to their creations. Several recycled jewelry artisans also create with this material. Love this idea for young girls! I am always leary of using metal components in jewelry for children, so this is a great alternative! this is so vibrant and cool..so how do finish the ends...by wire wrapping?? Sorry Divya - I forgot to add the link. The post has been updated to show it so check out how she finished the ends. Oh I can see young girls having a blast making these. They're so bright and colorful.